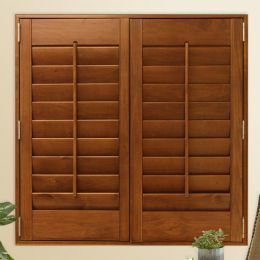 Wood shutters are known by many names, including plantation shutters, California shutters, and traditional shutters. But whatever the name, shutters are a truly classic window treatment that can transform the look and feel of a room, while also increasing the value of your home. Our wood shutters are made in Canada from 100% hardwood, and are available in 10 colours and stains - whites, neutrals and a range of wood tones from light to dark which match any décor. In addition, shutters are energy efficient and provide a good degree of insulation – helping to keep your room warm in the winter and cool in the summer. Our shutters come in 3 different louver sizes (2 ½”, 3 ½” and 4 ½”) which can be tilted all the way from fully closed to fully open, allowing you to control the amount of privacy and natural light coming into the room. Larger louvers provide the best view to the outside. You can also customize your window shutters to your own personal style, with a wide range of features & options, including panel configuration, hinge colour, decorative panels & frames and much more. Ready to order the finest window treatments available? Feel free to start with free samples or contact our Customer Satisfaction Team if you have any questions or need expert advice.